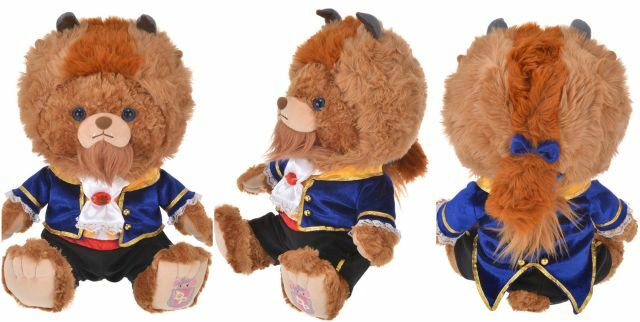 Following the successful release of the Cinderella Unibear , Belle and Beast are the forerunners this time around. 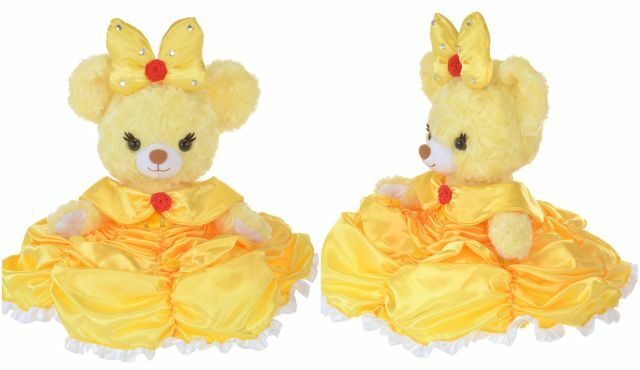 In line with the other Princess Bear nomenclature, Belle’s Unibear is named Rouge Rose, whose literal French meaning is “red rose”; Beast’s Unibear is named Fauvre which means “beast”, appropriately. 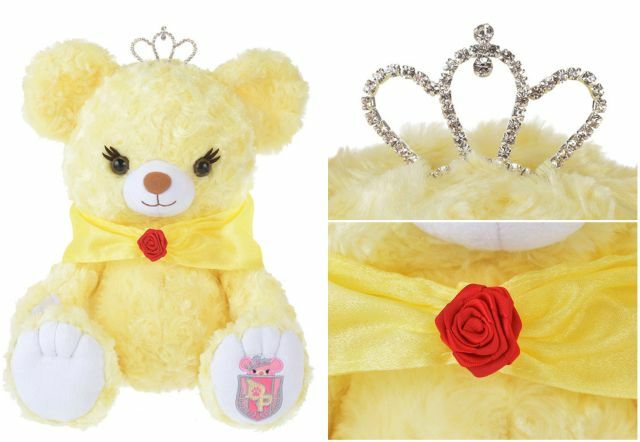 Rouge Rose comes in a light yellow shade with her body bearing the same rosette texture as the other Princess Unibears. Both her eyes and nose are shades of hazel. She comes adorned with a jeweled tiara and a sheer yellow shawl held together by a single red rose made of satin. 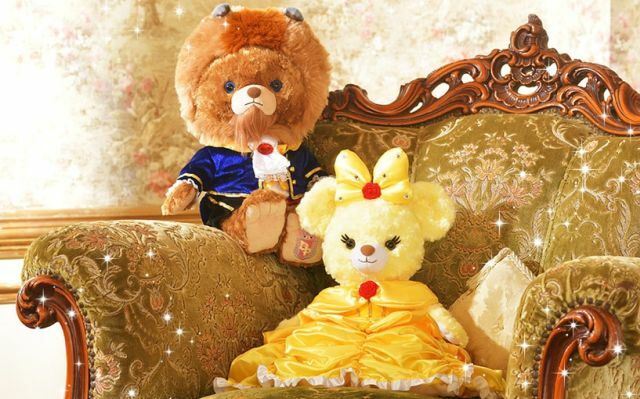 Belle is not complete without her famous ballgown dress which is sold separately from the Unibear itself. 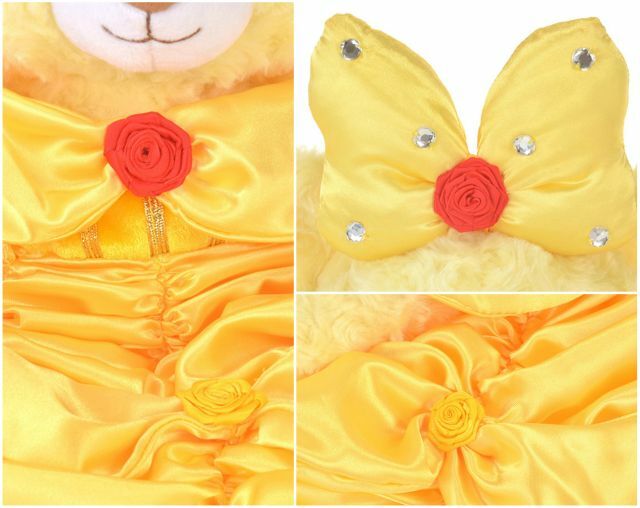 It starts with a light yellow bow that is bedazzled with crystals and held together in the center with a large red satin rose. The entire gown is made from a light satin fabric, gathered together in various places to give a fuller effect and topped with red and yellow roses. The dress is long enough to drape over and flow around the Unibear. 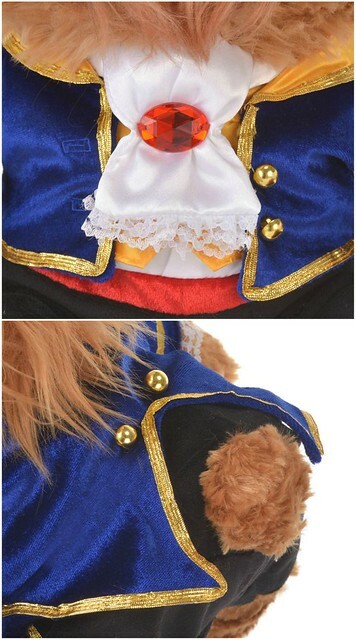 At 5400 yen, it is the most expensive Unibear costume to date. Fauve has several unique features that differ from other Unibears. Unlike most Unibears which come in a single shade of colour, Fauve comes in two shades of brown. His body is an earthy hue and his ears a richer shade. He is the first Unibear to be depicted with facial hair, namely the long brown fur that extends from his chin and his chest. This also continues at the back as can be seen with the ponytail tied together with a navy ribbon. He comes wearing a purple satin cape that is held together by velcro and topped with a yellow crystal. Like Belle, Beast has the ballroom costume available for separate purchase. The royal blue blazer and black slacks are made of velvet fabric with gold lining the edges. There is an open seam in the back of his black slacks to make room for his fluffy tail. Topping it off is a white satin cravat held together with a red crystal. The best part about the costume set is that it comes with a headpiece that is meant to resemble the makeover Beast gets. This essentially covers up Fauve’s ears and gives his head two colour tones. Fauve also happens to be one of the largest among the Unibears. 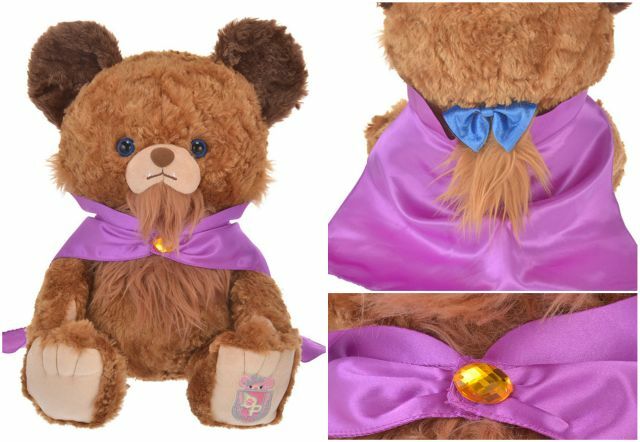 All images and information credited to Disney Store Online Princess Bear.